Update: RampVR™ won the Technological Solutions award. In the aviation industry, having highly trained ground operations staff is critical, not only for their own well-being, but for the safety of passengers and crew at airports, as well as to protect expensive equipment. But how can employees be trained effectively if they are unable to experience working in real life situations and learn on site? This was a challenge faced by the International Air Transport Association (IATA); the organisation that supports the aviation industry with global standards for airline safety, security and efficiency. In 2016, IATA teamed up with Future Visual, the Brighton based, award winning VR company to explore training possibilities using immersive technologies. IATA’s established training programme provided trainees with extensive classroom based learning, mixed with shadowing experienced staff. Although this gave trainees a thorough theoretical grounding, it could not give them a real sense of the airside space they would be working in, including the impact that adrenaline, fear and things going wrong may have on their reactions and decision-making skills. Giving trainees access to training in a real airside space is extremely complex. As it is a busy working area, it is a potentially dangerous and noisy space and coupled with the high level of security needed to access the space, training in situ is completely impractical. 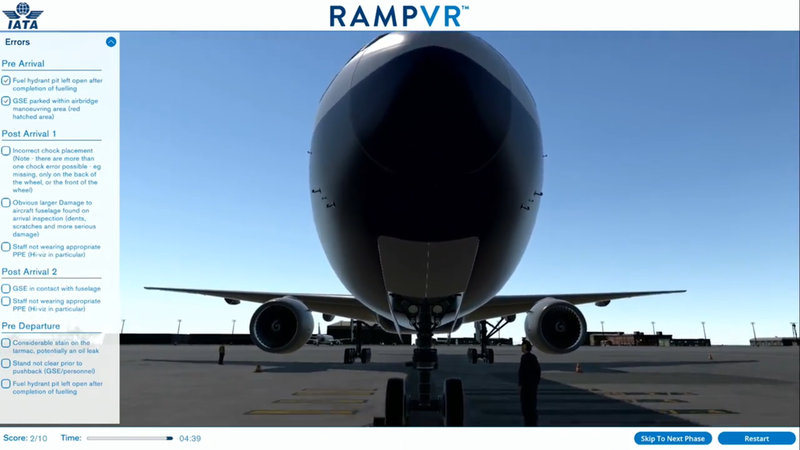 To address the training challenge, RampVR™ was developed in early 2017, introducing the industry’s first VR training platform for ground operations. It was launched in front of a global audience at the IATA Ground Handling Conference (IGHC) in Bangkok in May 2017. 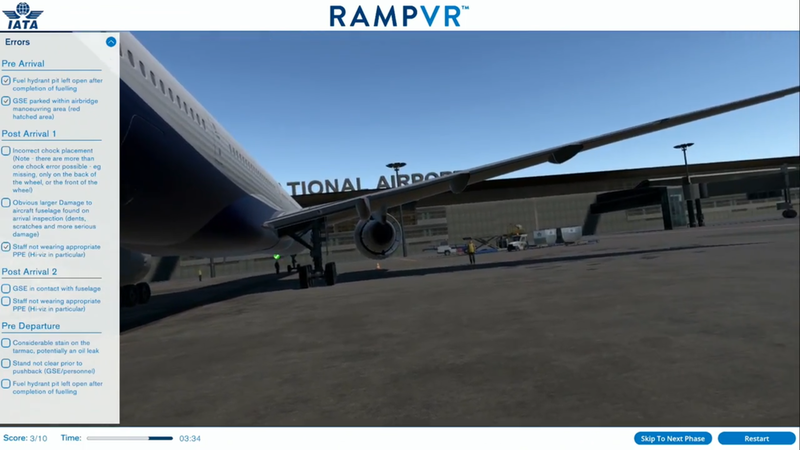 The VR graphics and rendering was produced by Future Visual and developed to IATA’s specifications, to meet the training needs of airlines, airports and ground service providers. For Future Visual, ensuring that the final resolution was a realistic as possible was essential, whilst working to budget and tight timescales. Two modules were produced; the Aircraft Turnaround Inspections module to train staff loading and unloading aircraft and the Aircraft Marshalling module. Both were developed using the Unity pipeline and delivered on the HTC Vive. 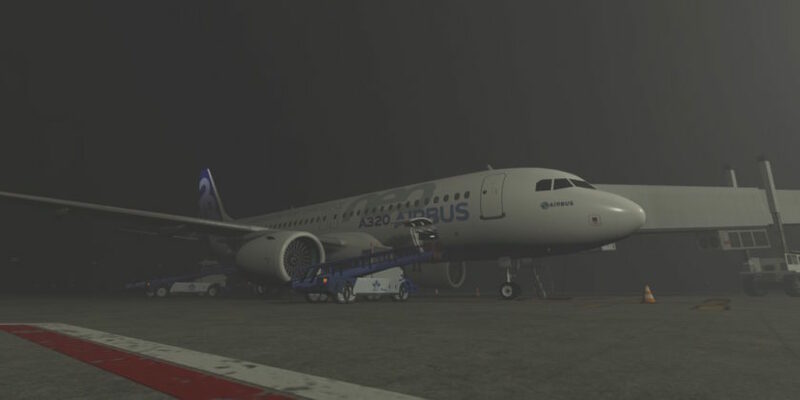 A computer-generated environment was created, accurately replicating the airside space where ground staff would typically be working. Trainees are supported throughout the experience and can pause it at any time to access key reference material to support their learning. Creating an immersive experience that is true to life was crucial to the successful adoption of the modules, as well as on the learning impact on trainees. As such, throughout the training, participants are placed in numerous scenarios to address operational issues, such as foreign object debris and marshalling aircraft. To truly reflect the reality of work, conditions can differ, replicating day and night, a variety of weather conditions, clear and low visibility, as well as working besides narrow and wide-bodied planes. In the case of the Marshalling module, trainees can use the HTC handsets to perform the correct hand signals used on the tarmac. The training is integrated into IATA’s training programme, complementing classroom based learning and it is fully compliant with IATA standards, as set out in the Airport Handling Manual (AHM) and IATA Ground Operations Manual (IGOM). It has built-in metrics to monitor and track each trainee’s performance which is fed into their overall training records.